2014 was a fantastic year for Tinderbox, we started a number of new creative projects and orchestras, and worked with many young people across the city. Here’s a quick summary of what we got up to. 2 new youth orchestras – Frontiers Orchestra & Journey of a Thousand Wings Orchestra – which we hope will become annual programmes. Scotsman Fringe First Award for the show Hand Made in China: Moons Migration & Messages working with Hua Dan Dumpling Dreams Theatre & Migration Company and the Beijing Community Rickshaw Gallery. 10 public performances, to audiences over 3000 people – We played at some amazing festivals, including Hidden Door, Kelburn Garden Party, Knockengorroch, the Edinburgh Mela and Edinburgh Festival Fringe, and put on several of our own productions. 15 creative apprenticeships – young people under 25 gained experience as orchestral apprentices and young arts administrators, playing a key role in delivering all of the work we undertook this year. 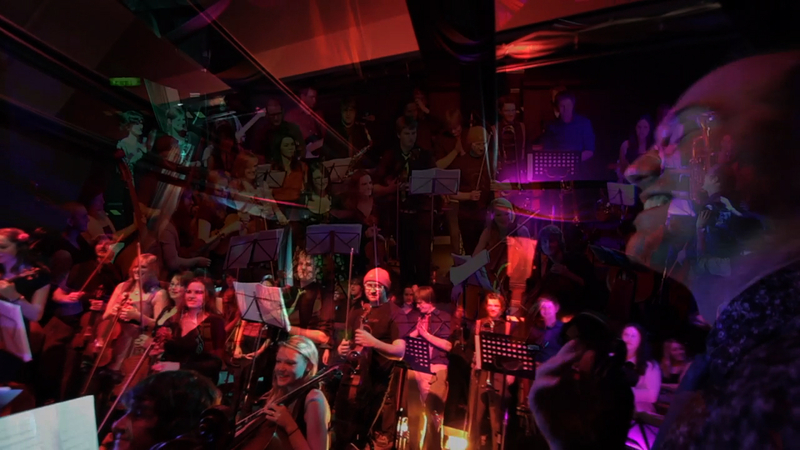 10 new orchestral compositions – written & orchestrated by a mix of young musicians and professional composers in Edinburgh. Collaborations with local and international bands – Black Diamond Express, North Atlantic Oscillation, The Jellyman’s Daughter, Dawanggang, Ensamble Transatlantico de Folk Chileno, Kakatsitsi, Dance Ihayami, Balkans Music Project and My Brightest Diamond. Started to record our first album – We spent our first weekend in the studio to start recording our debut album, which will be a mix of original compositions and collaborations with local bands. Worked with many amazing partners and funders to help us deliver all this work & make it possible – Alchemy Arts, Hidden Door, The Jazz Bar, Kelburn Garden Party, Media Education, North Edinburgh Arts, Oi Musica, Queen’s Hall (partners). A huge thanks to everyone who supported us, worked with us, played music with us and came to our shows in 2014… Looking forward to more in 2015!